"There was one little baby / who was born far away. / And another who was born / on the very next day. 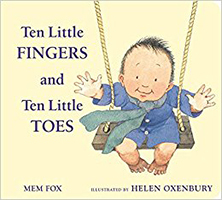 / And both of these babies, / as everyone knows, / had ten little fingers / and ten little toes." 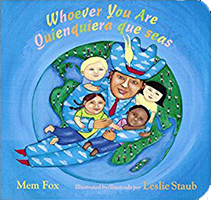 No matter which part of the world a baby comes from—born on the ice or in a tent—that baby has “ten little fingers / and ten little toes,” the pleasing refrain of this wonderful, rhyming tribute to the chubby, sweet universality of babies of all colors. Helen Oxenbury’s soft, rounded babies are captured perfectly in soft, rounded watercolors.